California based band 'There Be Pirates' put on a stirring performance at the museum on Sunday. Visitors packed out the Manor House to see and hear the pirates' music performed, and to take part themselves, children of visitors were encouraged to provide backing music as drums and maracas were distributed among the audience. Below is a video of some of the show (sound quality is not great but it gives an idea of the fun) as well as some photographs of the Pirate band. New volunteer and saddler Kieran has been at the museum this week giving demonstrations of his work and making various leather items. Many belts were made for eager staff and visitors as well as stirrup leathers and other items. The video below shows Kieran at work in the saddlery, busy making a beautiful leather belt. What is a Bal Musette? Bal-musette is a style of French music and dance that first emerged in Paris in the 1880s and was hugely popular through the Thirties, Forties and Fifties, but lost out to the Rock and Pop invasion (originating in Britain and America) in the Sixties. It is now enjoying a revival as people rediscover this uniquely French culture. Industrial Paris was the melting-pot: there were large numbers of migrants from the Auvergne (the middle of France), and also many Italian workers. The Auvergnats brought a type of bagpipe called a musette, and a dance called La Bourrée. The Italians came with their own styles and with their accordions. As the music developed in complexity, the accordion became the chief instrument, accompanied by banjo or guitar, bass, saxophone and drums. Musette was enriched by swing and jazz influences during and after the Second World War. Some of the dance establishments were very seedy! The musicians, for their own protection, climbed into a gallery, and the ladder was removed for the evening! 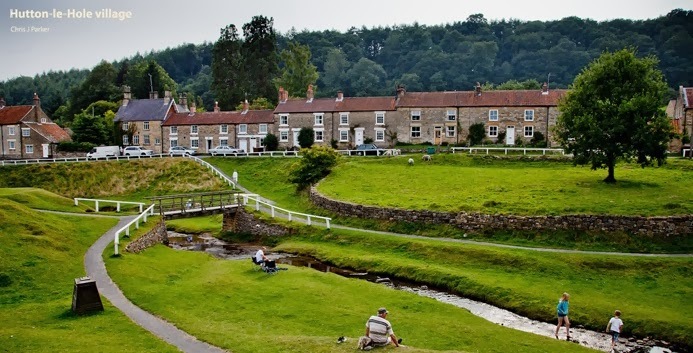 The “Bal Musette” at Ryedale Folk Museum will be a far more salubrious affair, and suitable for all the family! To accommodate more dancers on a crowded floor, compact, rather intimate versions of the dances emerged. There was the Tango, imported from Argentina, the Paso Doble, which is a Two-Step danced to Spanish music, the Valse Musette, which is about twice as fast as an English Ballroom Waltz, and finally the Java, which developed in Thirties Paris, with a novel rhythmic feel and very compact, intimate dance steps!
. ** Soundfile “Véronique explains the Java dance” 48 seconds. By 1945, the bal-musette became the most popular style of dance in France and its biggest stars were famous across the country. It went into decline in the Sixties, but is coming back, especially in larger cities, and a modern form of the musette is establishing itself. 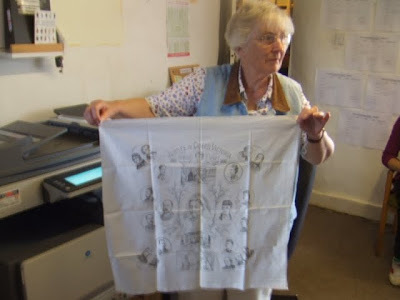 Following the success of Saturdays Bal Musette at Ryedale Folk Museum, it may become a yearly event, see you next year! Have a look at the video to see and hear some of the celebrations. Below is a video, filmed by volunteers of the return of the tractors to the museum on tractor and engine day 2010. Summer is finally here. I am taking my weeks holiday next week. Can't wait!!! Of course I am going to miss working at the museum but I shall be back before you know it. I have had another busy week. On Monday my tutor from college came. That went really well because we managed to get lots of things completed. On Tuesday David and myself went to college for the last time before summer. This was also good because we completed all the work needed and we just had lots of fun. We thought as it was our last time at college, we decided to go to the cinema. Thursday I was in Fat Betty's for a while again helping with the summer craft. I also started to do the signs for the Pirate event. Today Emma and I have been to Kirbymoorside school for most of the day and there we did three science challenges which involved getting rather sticky. The three activities were making a tower out of marshmallows and spaghetti, making something which holds an egg and then trying them by dropping them on the floor to see if they would crack and the last activity was to learn how to juggle. No way am I an expert at juggling. However the main thing is that we all had fun!!! If not have a fabulous summer!!! After a long night Edd awoke to a wonderful smell in the air. "What is this" he thought to himself. Adam had got up early to start making fresh bread. Adam was a superb chef and had considered going into the restaurant business. After a good breakfast of bread and ale Edd was ready to start his morning business. Unfortunately Edd had been round to Mike's the night before and had eaten some dodgy chicken pie and so the morning business took longer than usual. After hearing Edd shouting Adam decides to make him something that will cheer him up. Adam decides a hat would be the best thing to cheer Edd up so he set to making the perfect hat. to do this Adam needed to use the loom and spinning machines.After a traumatic ordeal Edd finally arrived back at the house. he was very surprised to see a new hat waiting for him. He loved the style of the hat although there was a little problem, it didn't fit over his Afro. Never the less the morning chores had to be done. Adam headed off to the cowshed to milk the cows whilst Edd stayed and swept the floor. Next Adam went off for his morning lessons about how to keep chickens efficiently. After a long boring morning at school Lieutenant Colonel Parker turned up to tell Adam about a life in the army. Adam was amazed by some of the things Parker had said and couldn't wait to join. Adam ran home as fast as he could and told Edd about Parker but Edd was having none of it, He wouldn't let Adam join the army and that was that. Next Adam and Edd went house shopping, the first house they saw was perfect, except the currant occupant was a witch, who refused to leave, and then turned Edd into a Giant! The witch controlled all of Edd's movements and they began attacking houses but then Doris the gardener came along and hit the witch with some compost and all was well again. The houses were now to small for him to fit. Fortunately his size was only temporary, and soon he and Adam were back looking at houses. However this one did need a lot of work doing to it, which Edd was not prepared to do. They decided to keep looking. The next house was brilliant! It had lots of room for both Edd and Adam and their activities. However, Edd had gotten lost in the maze and could not find his way too the house. Although he did stumble across one which suited him perfectly! He even found a horse that could move him from place to place. Arriving at the museum we did not know what too expect however we were greeted very warmly by everyone here at the centre. Too start things off Helen gave us a quick whistle stop tour of all the exhibits and showed us her knowledge of each historical subject. Edd especially liked seeing all the animals around the museum. After this we were shown how to catalogue all of the items that entered the museum, this process took time to accurately log the information required in the system. The information needed for each item included; identification, production, physical characteristics, inscriptions and markings, reproduction, condition, acquisition, ownership and last but not least location. After having a go ourselves, Helen then showed us both where items not currently on display were stored, we couldn't believe how many items the museum had that were stored. A lady then came to the museum interested in borrowing some iron age artifacts. We were then shown the archeology store, which had a number of different iron age items, including an antler which had been modified for digging purposes and a perfect Beehive hand and quern stone commonly used by Romans for grinding corn. Arriving at the museum at 8:30 Emma issued us with the days main task, this involved ferrying school children from the centre to the village hall and then helping out with the different activities happening there. These activities included; science in your lunchbox which looked at different aspects of food including glucose free bread, how to make cheese and the effects on leaving fruit out. An archaeological activity run by people from the national park, this involved finding and taking care of fossils and how to stay safe whilst doing this. The final activity was one for Railway safety, presented by the national railway museum which looked at young peoples views on the railway and how to stay safe on the railway. On Wednesday Adam was attending a university open day so i was on my own. The first job of the day was to help Emma and Barbra open and setup Fat Betty's. after this i went to help the other Emma in the education centre. There i had to restock packs for school children to use when they come to the center. After this i helped make some face masks for a children's activity day in summer. In the afternoon i was asked to run fat Betty's for a while, whilst doing this i got talking to some of the customers form all over the world who were exchanging stories of times gone past. Before i went there was one last task for me to to, take Jim the dog for a walk. Today was the day, the judges for the In bloom contest were to judge the museum. To start the day we swept all the stones off the paths and back to the gravel area. After we got the paths looking good we went and did some more on the archives with Helen, we had an interesting certificate to archive which was from the amalgamated society of carpenters and joiners form nearly 100 years ago it was made of card but we didn't want to damage it so we wore cotton gloves. After we had finished the records we started to take photos for a comedy blog we had been asked to make then we started making it. Today the museum hosted yet another highly popular Tractor and Engine Day. Many machines were on display, but what I found most interesting were the traps; man traps, gin traps, badger traps. All now illegal to use, but a reminder of how things were done years ago before the advent of the electronic burglar alarm. Featured in the tractor run in (pole position) was our Museum Manager Kevin Sims on his beloved Fordson Dexta, and on the tandem were 2 museum volunteers, Peter and Jim. Results as follows: Best Engine- Richard Nesver showing a Lister stationary engine. Most Original Tractor - Chris Stevenson with a Field Marshall. A short video narrated by John L, of Carrie and Jake using the rope making device from the museum's collection. 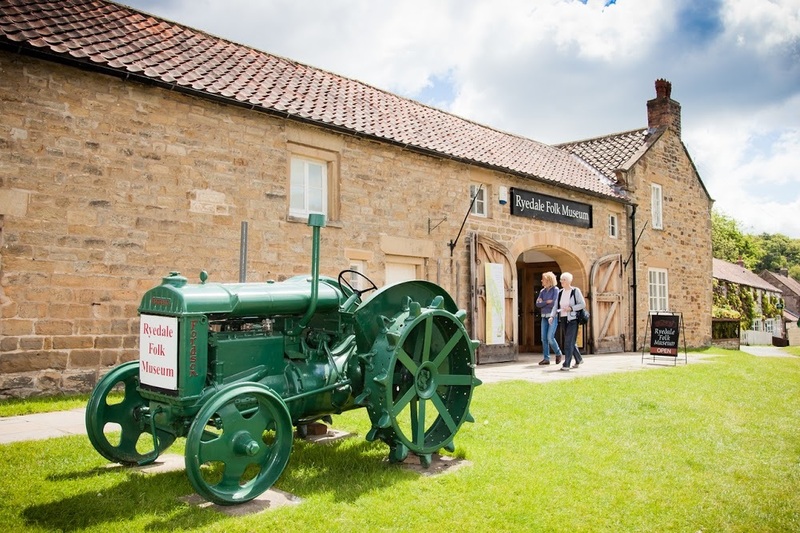 Rope making is going to be one of many added activities taking place throughout the summer and visitors are encouraged to have a go at making their own rope to take home. Training up of rope makers is currently being carried out so if any volunteers want to learn, contact the museum. Wow, I haven't done a blog in ages. Recently I have been fairly busy, well... busy enough not to do a blog! I on the other hand... I have been delivering some schools. And doing other duties. such as college work and keeping the houses tidy, and doing errands. I am also helping to create a list of all the activities going on, in the summer Holidays. So look out for that!! We had the 'Trike Rally' in today (3 - 4th July 2010) and yesterday, and they were such nice people. I was a little scared of talking to them, you know... their SKULL BANDANNAS and their LEATHER JACKETS and all their TATTOO'S and all that jazz, but when I got talking to some of them they had some really interesting stories to tell. And there bikes... well i should say trikes really hahaha, their TRIKES are amazing I couldn't imagine someone could as easily think of something so simple yet so advanced to be absolutely fascinating. Anyway, I'll do my best to do more blogs, and hopefully see you in the museum sometime. Queen Victoria was Britain's longest reigning monarch, here Meriel is showing us a nice handkerchief that was a souvenir of Victoria's Golden Jubilee. 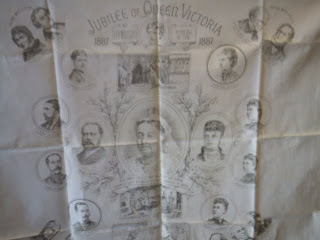 The handkerchief shows Queen Victoria's sons and daughters and also the Prime Ministers during her reign.